The seat is made entirely of carbon fiber (as required by Formula 1 regulation) in order to facilitate the exit from the cockpit in case of accident. Seat and driving posture are the result of a careful technical experimentation (accomplished by Evotek Engineering) to achieve everyone’s comfortability and maintaining, at the same time, the typical setup of sports driving. The integrated ventilation of the driver’s seat has always been a unique feature of Evotek Simulators. Generally the adrenaline and the emotional tension during the driving experience lead to a high perspiration. The ventilation system effectively limits this problem and makes possible to drive in suit and tie. 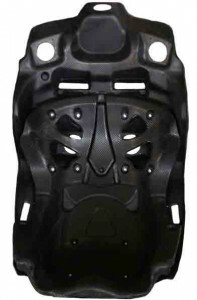 Evotek Sym system has now been made more efficient by the seat structure conformation. This structure surrounds the outer surface of the seat and makes the flow of ventilation more dynamic and balanced on the whole surface. You can already experience it with Evotek Sym 026.